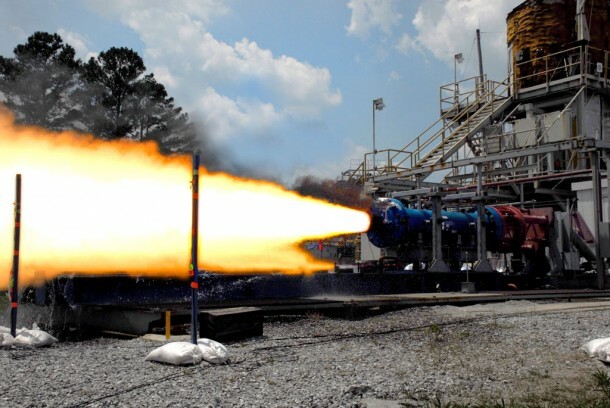 A 2010 test of a solid rocket motor based on space shuttle test equipment at NASA’s Marshall Spaceflight Center (Credits: NASA). Ammonium Perchlorate, the primary oxidizer used in solid rocket boosters, will potentially face new regulation from the US Environmental Protection Agency (EPA). Chronic exposure to perchlorate, which also occurs naturally and is present as an impurity in nitrogen fertilizers as well as used in other pyrotechnic applications, can impede thyroid iodide uptake. Exposure to humans mainly occurs through drinking water and produce. In 2009, the EPA set a provisional advisory limit of 15 µg/L of perchlorate in drinking water. The agency is now reviewing data to determine whether a stricter limit is warranted. Some US states have already set their own stricter limits. California allows up to 6 µg/L while Massachusetts allows only 2 µg/L. The rationale for the stricter limits is potential thyroid effects particularly on young children and fetuses, for whom thyroid hormones are critical for proper development. EPA’s investigation is being challenged by The Perchlorate Study Group, an organization supported by Aerojet, Alliant Techsystems, and Lockheed Martin among others. The group objects to EPA’s consideration of research published only since 2005, preferring the entire body of literature to be weighed in the decision. The group’s sponsors could be required to pay additional clean up costs if perchlorate limits were to be tightened. The EPA convened a group of experts to consider the evidence in July. The agency is expected to publish new guidelines in February 2013. There is no worldwide consensus on perchlorate safety. The US was the first to experience contamination from the chemical and has led the way in terms of regulation. The World Health Organization has no perchlorate limit recommendation and widespread contamination has not been observed in Europe, although contamination is growing in Japan, China, and Korea. Ammonium perchlorate is used in Europe’s Ariane 5 boosters and Vega stages. Russian rockets are mainly based on liquid propulsion. In large concentrations, perchlorate can have more severe impacts. In 1988 ammonium perchlorate manufacturer PEPCON was levelled following an explosive fire accelerated by accumulated ammonium perchlorate. The material was produced for use by NASA’s Space Shuttle, but the grounding of the shuttle following the Challenger accident left PEPCON with 4500 tons of the material and no where to ship it. Two people died in the factory and the shockwaves broke windows and blew doors off their hinges within a 16 km radius, even buffeting a Boeing 737 as it approached landing at the airport 11 km away. Inhabitants across that area experience eye, skin, and respiratory irritation from the dispersed chemical. PEPCON adopted a new name, Western Electrochemical Co (WECCO) and built a new plant. An explosion there in 1997 resulted in one dead and four injured. WECCO is now the only US manufacturer of ammonium perchlorate used in solid rocket propellant. Well written and highly informative.